In a large stock pot set over medium high heat add the olive oil. Season the rump roast on all sides with salt and pepper. Sear the roast in the stock pot until a dark brown crust appears on all sides. Transfer the roast to a slow cooker. Add the onion, celery, carrots and garlic to the stock pot and cook for 5 minutes. Add the tomato paste and cook for an additional 2 minutes. Sprinkle the flour over the vegetables and cook another 2 minutes. Add the wine, beef stock and thyme and bring the mixture to a simmer, scraping up any brown bits from the bottom of the pot. Remove from heat and pour the contents of the stock pot over the roast in the slow cooker. Turn the slow cooker on low heat and cook for 8-10 hours, turning once. Remove the roast from the slow cooker and let cool slightly. Pour the remaining contents of the slow cooker into a strainer set over a large saucepan. Press on the solids to extract as much of the liquid as possible. Set the saucepan over medium heat and whisk in 2 tablespoons of butter. Season to taste with salt and pepper. 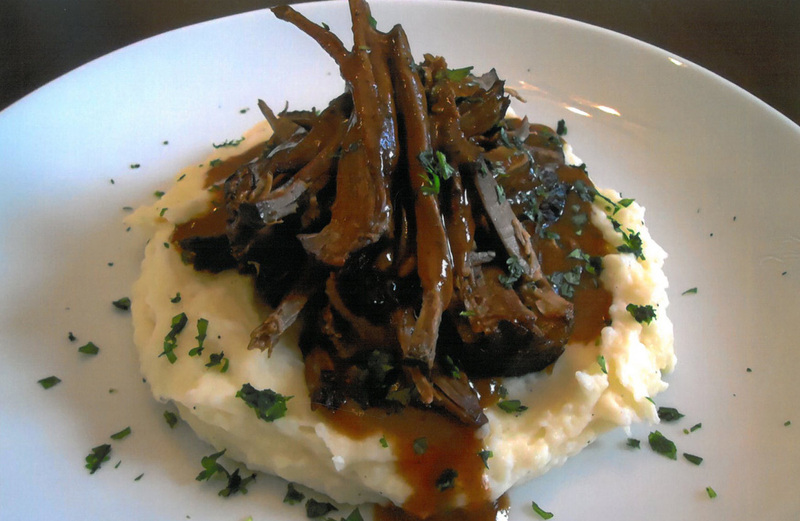 Pull or shred the beef and serve it with the gravy set over pasta or mashed potatoes.